Today is my last day at the Centre d’Études Supérieures of the Mauritius Chamber of Commerce and Industry. 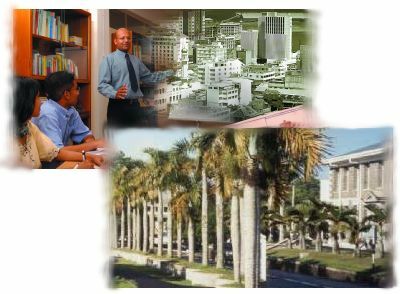 As from tomorrow, I’ll be at the University of Mauritius in the capacity of Lecturer in Computer Science. Good luck! There are very smart people at the UoM, and I’m sure you will like it. Je croyais que vous nous feriez cours pendant encore un mois. Si j’ai bien compris, Ã la rentrÃ© des classes nous aurons un nouveaux prof d’info? Yep ! I’ve survived ! I still neither have an office nor a computer (in fact I’m in a students lab right now) but life is cool at the UOM. My collegues are all very friendly and everything looks so much bigger (though not necesarilly nicer) than the MCCI. Normally, I’ll start lecturing next week. I’ll keep you posted. Je suis sure que tout va bien se passer pour vous et je tenais Ã vous dire que j’ai Ã©tÃ© fiÃ¨re et trÃ¨s chanceuse d’avoir pu assister Ã vos cours ! Bonne chance !